Terry Hope Romero and Isa Chandra Moskowitz get a lot of love on this blog, and with good reason: they are the queens of the vegan cooking world. Last month I cooked from Veganomicon, their first cookbook together, and concluded that it was good for the basics but they’ve both produced better recipes since then. And I uncovered further proof of that this month when I worked my way through Terry’s (oh yes, we’re on first name terms) Vegan Eats World. As the name suggests, it’s a collection of vegan recipes from all around the world. It has a good balance of cuisines, and even a little sweet treat section, though I didn’t venture into it, and it has introduced me to the wonder that is mafe. Read on! The Andean Aji Bean Stew had to be improvised, largely because my local supermarket doesn’t sell chillies. Maybe spicy food just isn’t that popular here? So, I ended up just using chilli flakes instead of Aji. 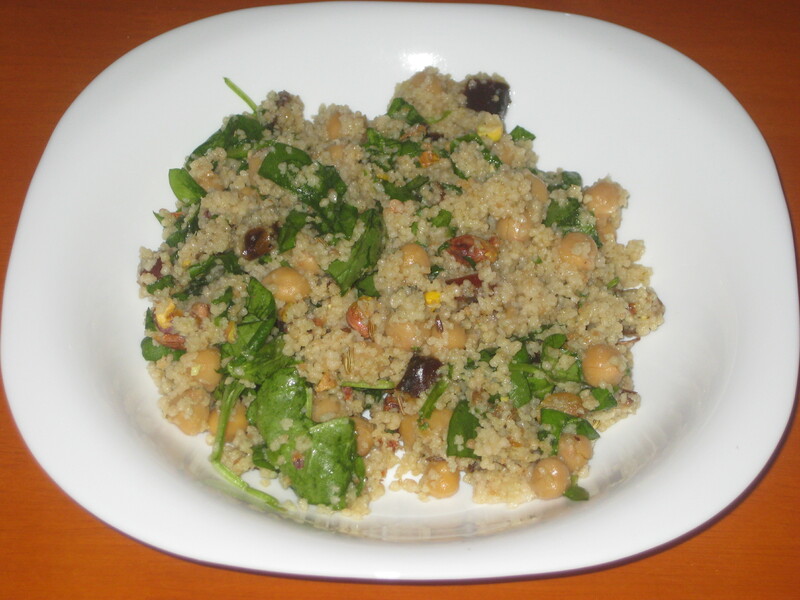 It was nice and hearty with the quinoa and beans, and partially blitzing gave it a great texture. It was packed with smoky flavours. 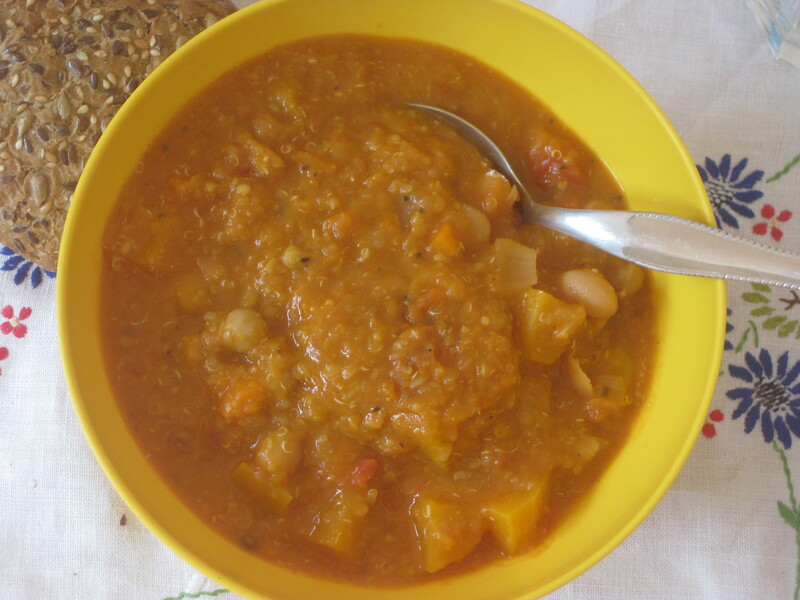 The ginger peanut squash soup was probably my favourite, because I love a good peanutty stew-y soup. I added spinach and chickpeas to give it some colour and extra protein. 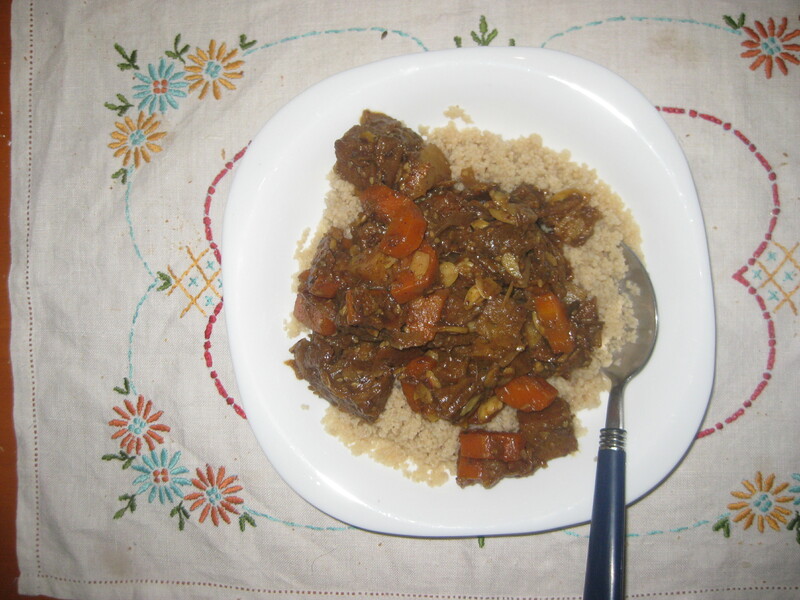 It’s really hearty and flavoursome, perfect for winter. 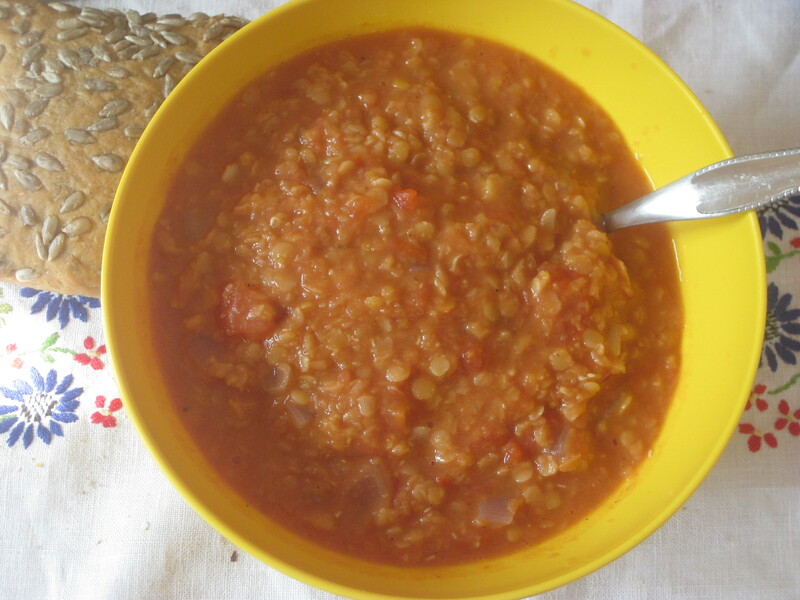 Unfortunately the red lentil and tomato dahl was a bit uninspiring: nice, but not very exciting. 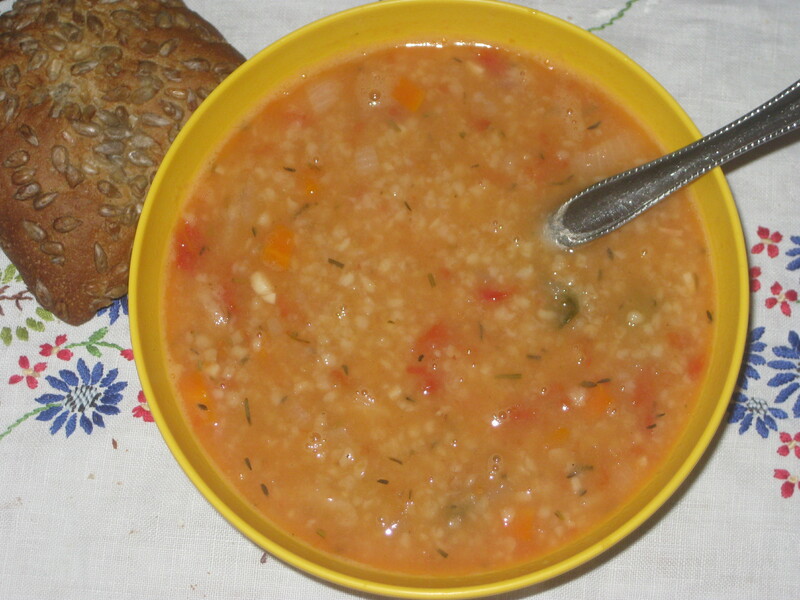 The white bean farro soup was much better. I couldn’t get hold of farro, so I used bulghur wheat instead. There were some lovely herby flavours in here. I love a good spicy soup as well, of course, and the Mexican black bean soup was solid. 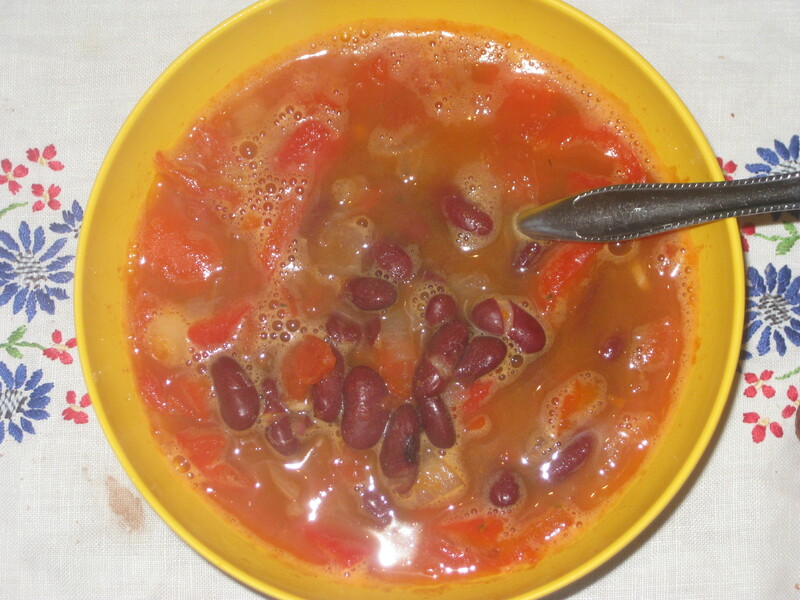 Soups like this are so easy to make: tins of beans and tomatoes, a good spice selection, and you’re away. Black beans have eluded me so far since I arrived, so it was kidney beans again. 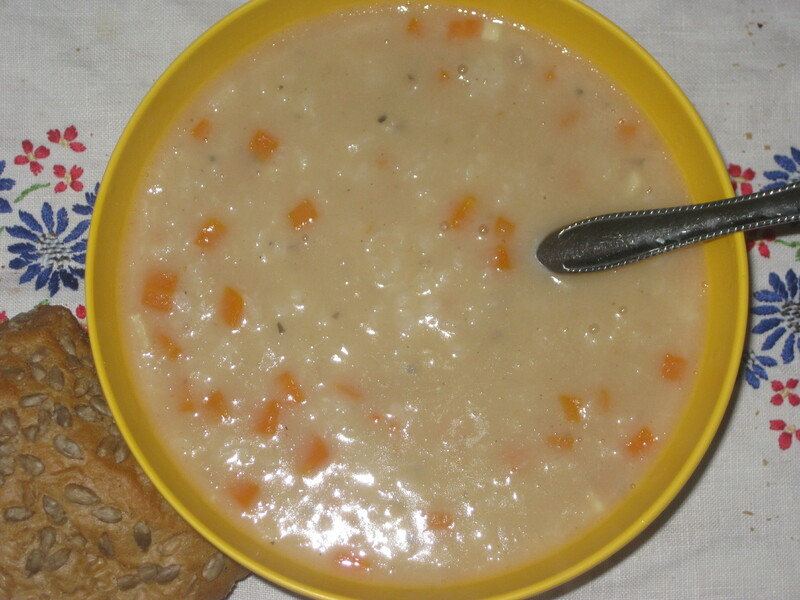 The Greek creamy lemon rice soup was not quite as special as some of the others (I tend to prefer African and Asian flavours to Mediterranean in soups), but I loved the flavour and creaminess from the pureed canellini beans, along with the nice lemon and herb aromas. I only used the arborio rice without any additional orzo, because I didn’t know where to find it. 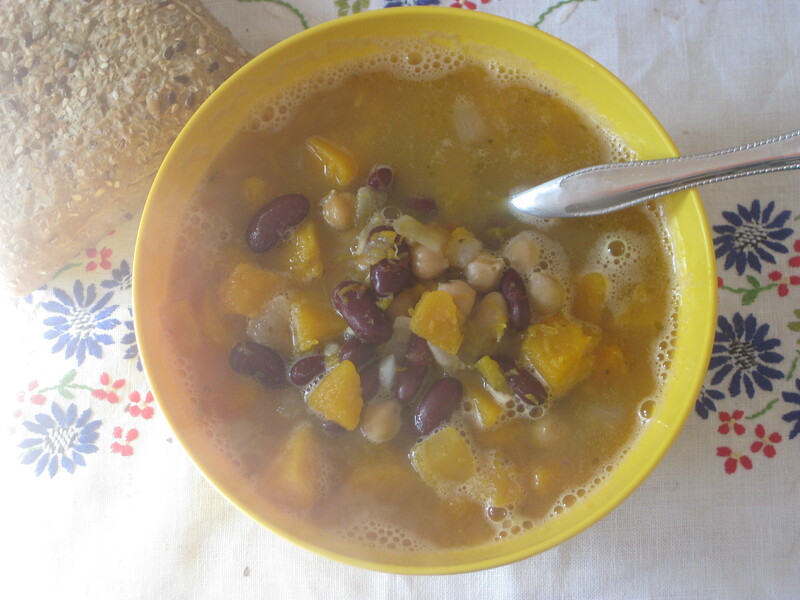 I served the pumpkin black bean posole stew as a soup, and it was perfect for the cold weather we’ve been suffering. The broth was really spicy and warming, and the veg and beans felt like they were protecting me from the wild outdoors. I used chickpeas instead of hominy, and of course, kidney beans. And I ventured into the salad section for one packed lunch: the pistachio date quinoa salad. I didn’t have any quinoa in so switched it for couscous. I loved it! It was quite a sweet salad due to the dates, but I have a sweet tooth so I didn’t mind. It was lovely, and I’ll definitely make it again for a quick and easy lunch. And so to the mains. 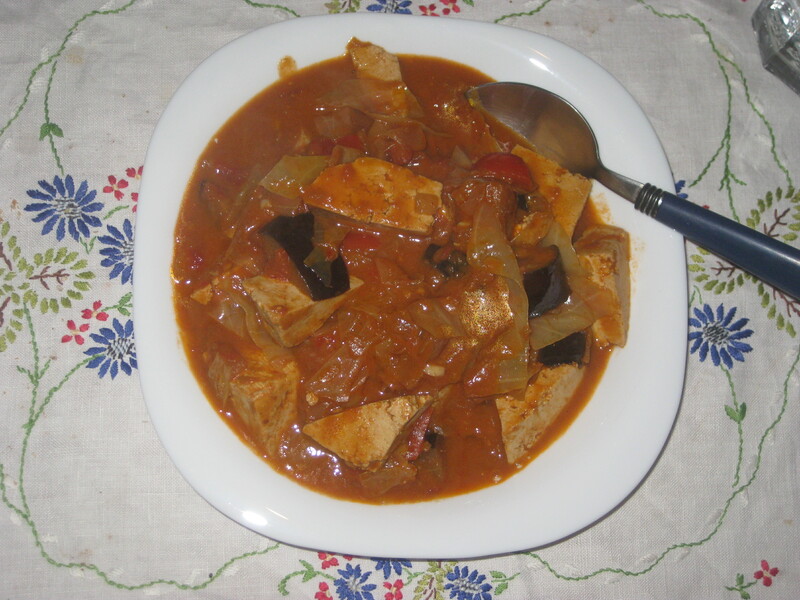 I started rather boldly, with the tofu and potato adobo stew – I wasn’t brave enough to add the vinegar, especially as I didn’t fancy my chances of finding coconut vinegar in Prague. I added a tin of chopped tomatoes and it was really nice. The flavour from the soy sauce was fantastic. The aubergine shakshuka was also delicious! 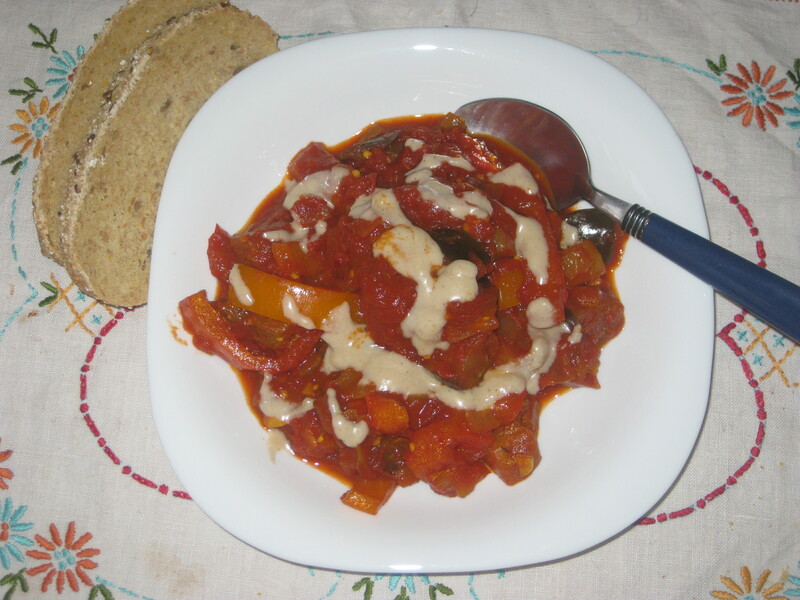 A lovely bit of heat, and lots of well cooked vegetables (aubergine chunks, strips of colourful peppers). Fresh coriander is hard to find here, so I didn’t make the green tahini sauce to serve, instead drizzling on a bit of tahini straight from the jar. It was good! 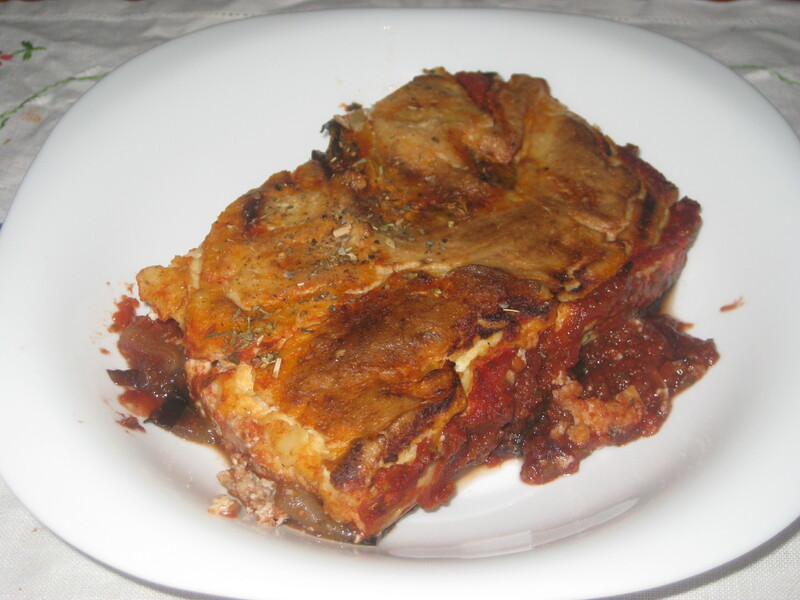 My aubergine parmigiano looked nothing like the one in the book, but I loved it! 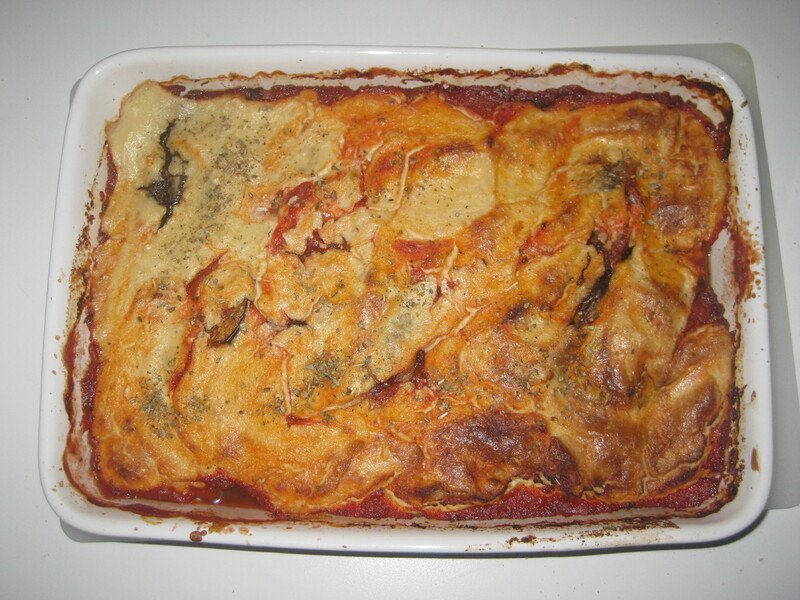 I was worried the tomato sauce would be too thin, but it was fine with the layers of aubergine. The ricotto-style layer was beautifully creamy from the tofu and cashews, and formed a nice thick topping – I’ll definitely use that again in other dishes. 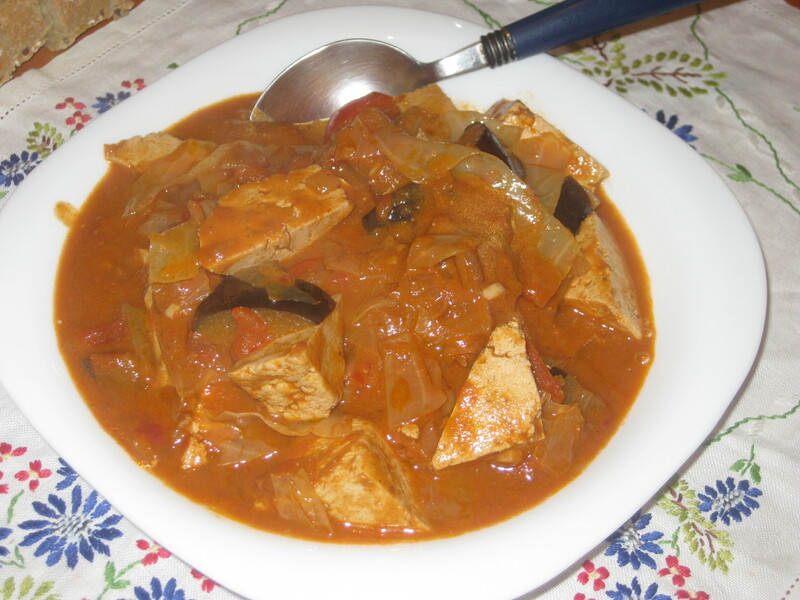 The seitan, almond and sesame tagine was great – anything with seitan is a winner for me! I really enjoyed the sweetness of it, and the meaty texture. After being underwhelmed by the curries in Veganomicon, I was a little hesitant to try one for Vegan Eats World. 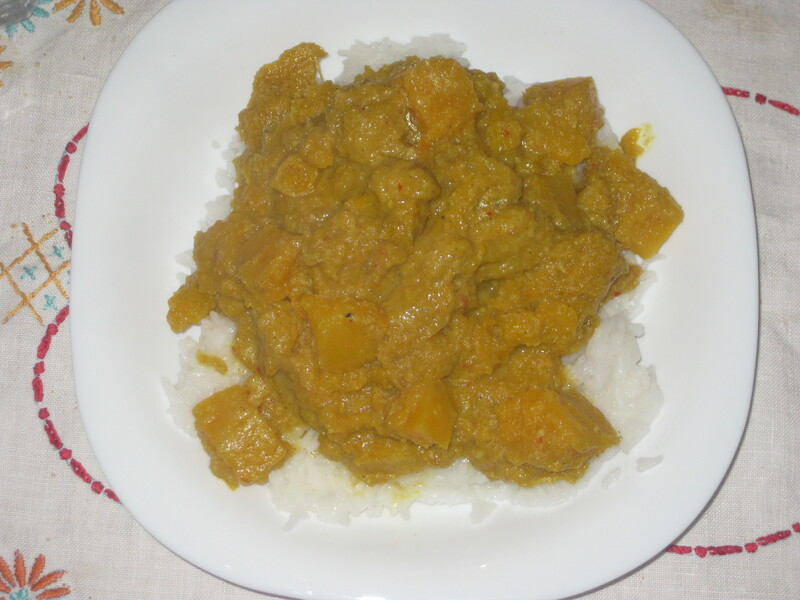 But I decided to brave the pumpkin coconut curry, and I’m glad I did – it had much more flavour than the Veganomicon ones, and I loved the texture: the pumpkin was cooked until it was just starting to fall about, which made the sauce a bit thicker and creamier. Delicious! The jerk roasted seitan strips were excellent! They smelled so good as they cooked and were so juicy and flavoursome. I served them with the island brown rice and peas. Dr HH happily referred to this meal as “steak and rice” and absolutely loved it. 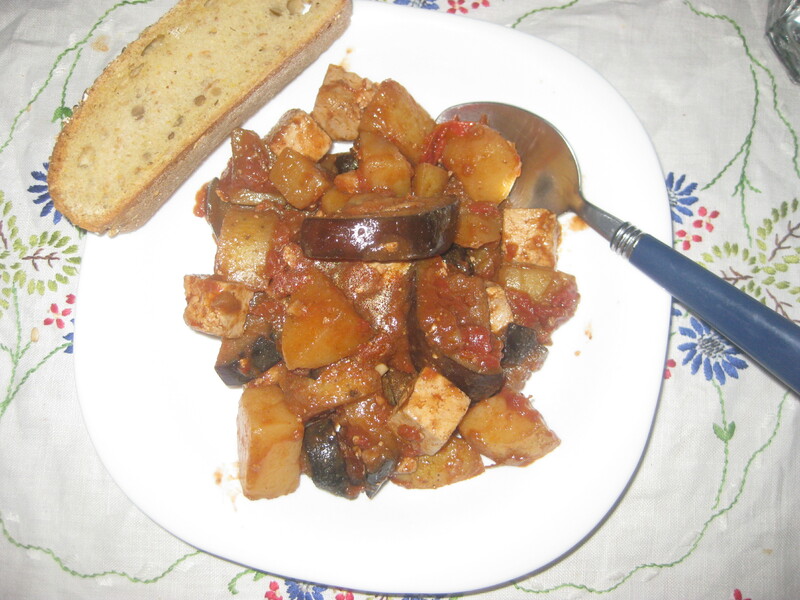 The Lebanese moussaka stew was nicely flavoured – I love cinnamon, and this tasted beautiful. 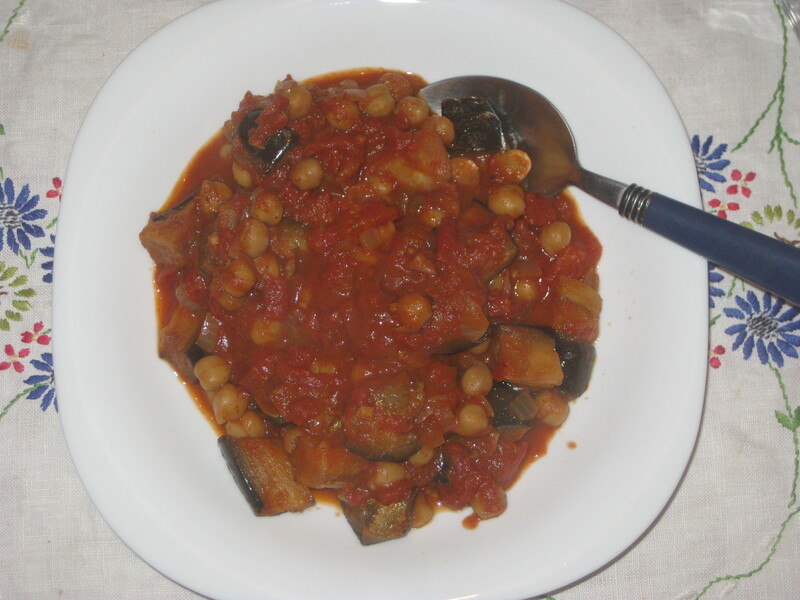 The aubergine chunks were melting, the chickpeas were good and chunky: both the texture and flavour were spot on. 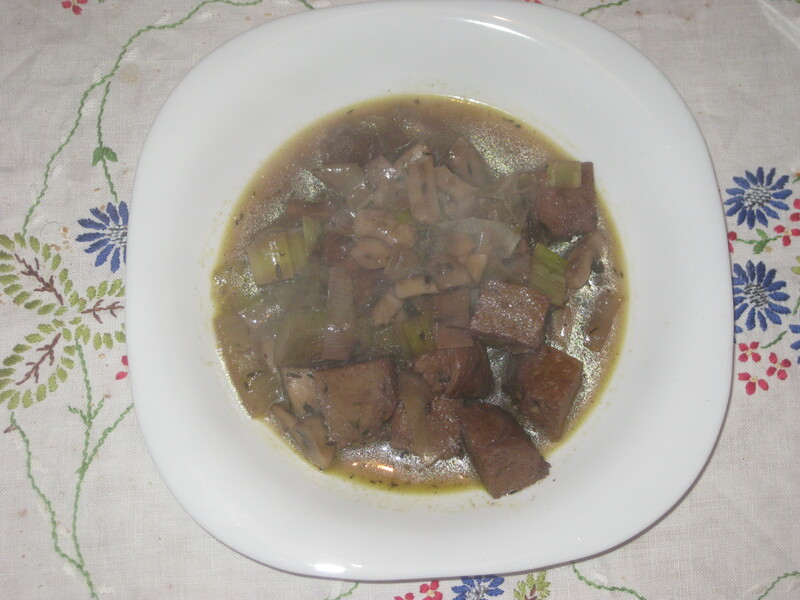 The red wine braised leeks and mushrooms sound like they should be quite fancy but, as is my wont, I turned them into a stew and beefed it up with some seitan. 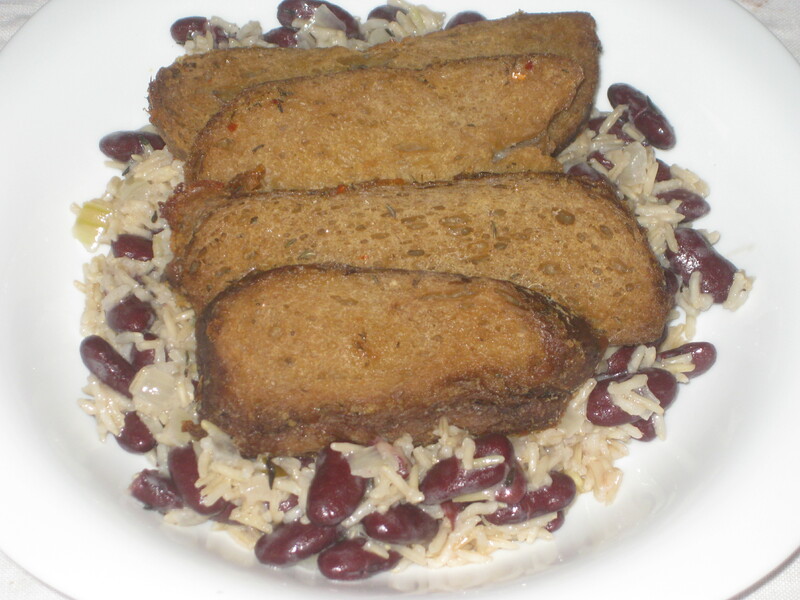 Seitan makes everything better. I had high hopes for it, but to be honest it isn’t one I’ll be in a hurry to try again. And, finishing on a high, I made this deluxe tofu vegetable mafe. I have no idea what a mafe is, and delighted in refusing to elaborate on it when Dr HH asked what was for tea. I have learned that mafe is delicious. Delicious! I will reveal a little about it at least: there’s marinated tofu, aubergine, pepper, cabbage, spices and good old peanut butter. I’m going to go out on a limb and say it’s African. And, it bears repeating, delicious! In conclusion, I loved this book! I thought it was more adventurous than Veganomicon and more consistently successful – the dahl and leeks were the only things that underwhelmed me, and even they weren’t bad. There are still more dishes I’d like to try, if I can work out how to get hold of some of the more difficult-to-acquire ingredients (not difficult for people in the UK, just for a rather bewildered person in central Europe). And most of the dishes I tried were pretty easy to rustle up and didn’t require long hours in the kitchen, making it very accessible. This one is highly recommended! 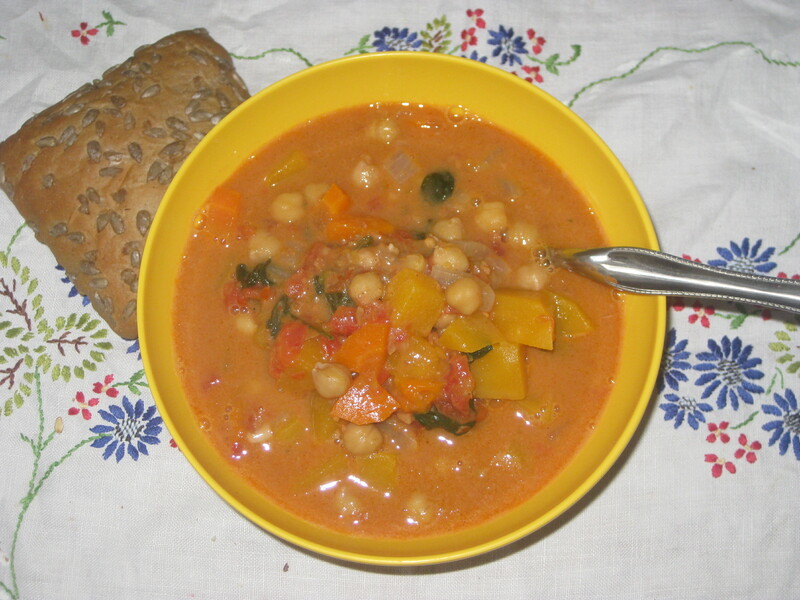 This entry was posted in Cookbooks and tagged Terry Hope Romero, vegan cookbooks, vegan cooking, Vegan Eats World. Bookmark the permalink. I love your cookbook reviews – they’re properly thorough, so I always get to see a good amount of the recipes in the book. I’ve heard good things about the book, and the dishes do look great. I’m intrigued by the mafe! Oh, thank you! I love working my way through a cookbook, even though I usually stick to soups and stews. Get the book and make the mafe, that’s my advice! I hear most people say the ingredients lists is the most discouraging, and I understand. I live in New Jersey which is probably one the best areas to live in to get these special ingredients as we have lots of ethnic supermarkets (asian, african, european, south american, mexican, whatever you can think of) But she does have I think a lot of different options if you don’t have access to it, or have recipes on how to make your own. And yeah, that mafe is probably the BEST! You’re right, a lot of the time it’s quite easy to make a substitution. I really miss having more international ingredients easily at hand. I love Vegan Eats World but I haven’t made any of these recipes!! I love the take out noodle recipe, it’s become my go-to stir fry sauce even though I mix up the proteins and veggies and if you plan to venture into the dessert section the tart tatain is ridiculously good. The dessert section looked really good, but it would involve buying cake tins/other tins, so I have put it on hold for the time being. I’ll definitely give it a whirl at some point though!